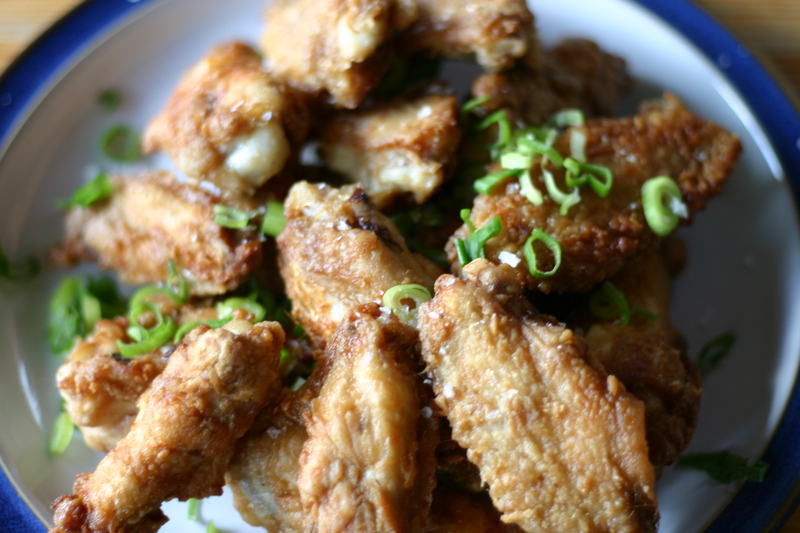 Chicken wings Japanese-style – what’s not to like? Remove the tips from the chicken wings if necessary, then slice in half. Make a lengthwise incision on the underside of each wing segment. Arrange the chicken pieces in a dish. Whisk together the sake and soy sauce, then pour over the chicken, turning to coat. Marinate fifteen minutes, then remove from the marinade and dredge each piece in flour. Heat a half inch of oil in a frying pan. When the oil is hot but not smoking, add the chicken pieces, skin side down. Cook about five minutes, turning when golden brown, then cook the other side. Remove to a plate covered with paper towel to absorb any excess oil. Serve garnished with sliced green onion.